Oregon Principal of the Year Curtis Wilson of Benson Polytechnic High School honored at Thursday assembly by peers, students and administrators. Curtis Wilson, Jr. was only OK with being the state's most celebrated high school principal after he learned the honor came with extra responsibilities. That's just the type of guy he is, say his wife and colleagues. 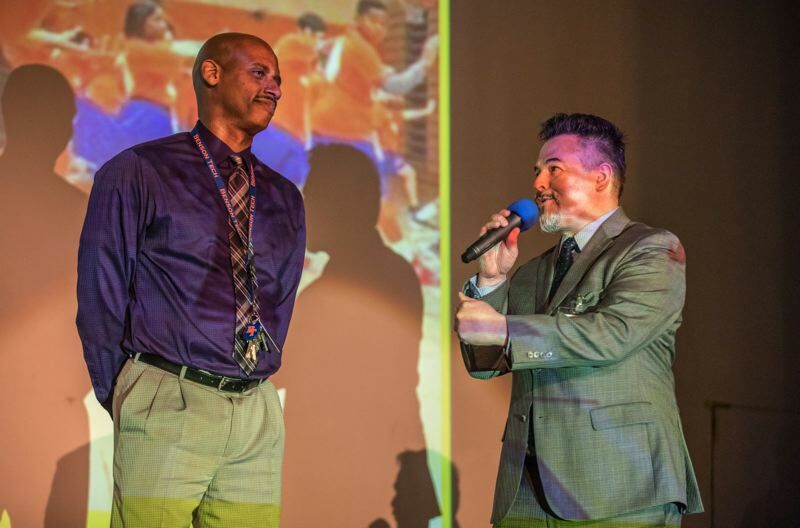 Benson Polytechnic High School's principal for the past five years, Wilson was honored Thursday, April 19, by staff, students, administrators and peers at an assembly. "In all our schools, we know how much leadership makes a difference," said Superintendent Guadalupe Guerrero in his introduction. "Principal Wilson, you are making that exponential difference." Wilson was surprised to be named the 2018 Oregon High School Principal of the Year by his peers in the Confederation of Oregon School Administrators and the Oregon Association of Secondary School Administrators. His brief remarks to the assembled cheering crowd reflected his discomfort with being in the spotlight. "I'd rather just work," he said to the Tribune afterwards. "I'd rather just do the job. "There's nothing wrong with being —" he said and trailed off. His wife, Yushonna Wilson, nudged him. "Recognized," she said, completing his sentence and beaming with pride. He smiled and said that he would rather have natural rewards, such as higher school-wide test scores and students being friendly to him in the halls. Wilson has had those rewards, too. The graduation rate at Benson Tech was 88.8 percent for 2016-17 and its dropout rate just 0.2 percent. The magnet school with a focus on trades — such as dentistry, machine shop and nursing — is also home to a large share of Portland's students of color. Roughly a quarter of the population is Latino, 15 percent black and a third white with 44 percent of students low-income enough to qualify for free-and-reduced-price lunch. The large inner Northeast Portland campus also shares space with several alternative programs and summer school options. 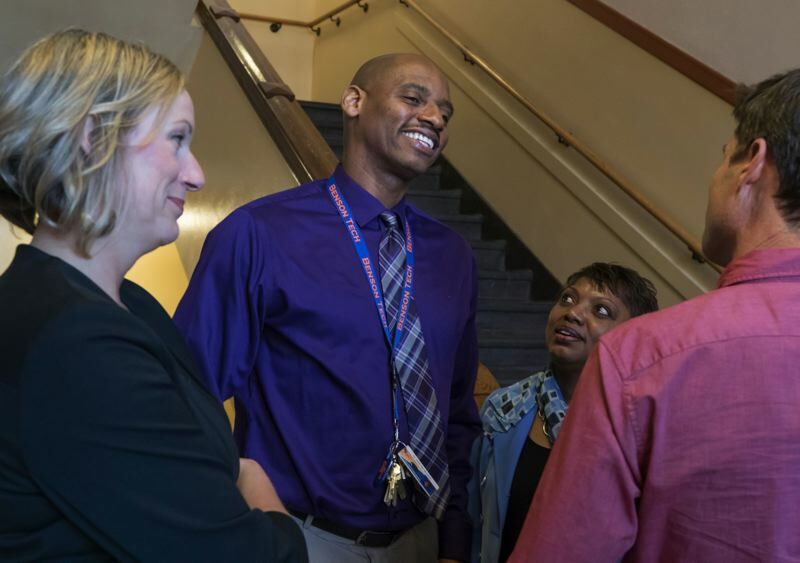 Yushonna Wilson said at first her husband didn't want the honor, with all its trips away from the school — including one this fall to Washington D.C. to vie for the 2018 national Principal of the Year. But once Wilson heard that the award came with the responsibility to represent his district and school, he reluctantly agreed: "Gotta do it." Benson Tech Vice Principal Tonya Mjelde, who has worked with Wilson for two years, said that's just who he is. "It's such an honor to work with him," Mjelde said, noting his integrity and work ethic that often has him working at the school until 8 or 9 p.m. "Running a high school is a really difficult thing. He's not afraid to enter into difficult conversations." Wilson started his career in Portland Public Schools and said he plans to stay with the district until his retirement. A Roosevelt High School graduate, Wilson's first role with the district was in a summer program when he was 18. After graduation from the University of Oregon, he was a health teacher at Harriet Tubman School in 1997, then a Roosevelt teacher before taking a vice principal position at Grant High School in 2007. Throughout his career, Wilson has focused on the benefits of exercise and sports by coaching basketball, track and cross country. Even today, he runs a Zumba class and opens the gym for basketball play three days a week. A colleague said she thinks he does it mostly because he misses spending time with kids. Asked for words of wisdom to other high school principals, Wilson seemed to stay true to that philosophy. "As long as you keep focus on students and work hard to collaborate with staff, I think you'll be fine," Wilson said, acknowledging that sometimes that's not an easy thing to do. "I just keep telling myself: 'Is this good for kids?'" Then Wilson leaned in conspiratorially: "And listen to parents," he said in a stage whisper and laughed. "That's it: kids, staff and parents." Wilson will be honored in June at the annual COSA Conference and at the OASSA/OESPA Principal's Conference in October. UPDATE (4/24/18): The location of Benson Tech was incorrect in a previous version of this story. It is in inner Northeast Portland.